britain earl photography blog: Tip of the Week: Ready - Set - MCP Actions!!!!!! This weeks tip is: MCP Actions!!!! if you haven't checked out this blog you are missing out on a wealth of photographic information! on top of giving some great advice, tips, and reviews on the blog, the shop is full of great actions and tutorials to help your images come alive!!! 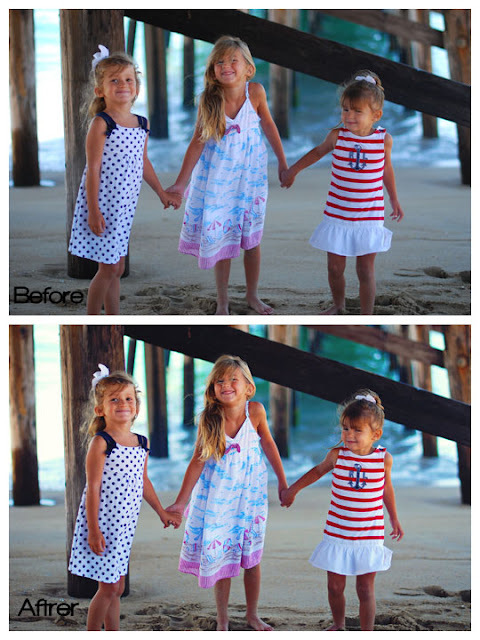 right now MCP is creating something new to make me swoon, Lightroom Presets! i'm so excited. Lightroom is quickly becoming my software of choice, and i'm thrilled to have a new tool to maximize my workflow! in conjunction with the launch of their Presets, MCP is having a giveway and contest. there are 3 chances to win: "like" MCP's Facebook Page, sign up with your email, and create an editing Blueprint using MCP actions. i love that i can use MCP actions to give a little "pop" to my photos. here's what i did to take this one from good to great! 3) used a black brush at 30% to take of some of the cloud 9 layer from the skin. i wanted to keep those deep brown tans! 4) flattened and saved as "after"
viola!!! now i have just what i wanted, a great relaxed portrait of my girls. the colors are slightly bolder and brighter, but the girls look natural and fresh, not heavily edited. i can't wait 'til i can get the full Fusion set, there are so many options to creatively edit your photos!